It seems these Enlisted Frock Coats have become my specialty. My latest is number twenty five. Here are some photos with brief descriptions for your enjoyment. First we have a coat in one of the early stages of production, the skeleton baste. 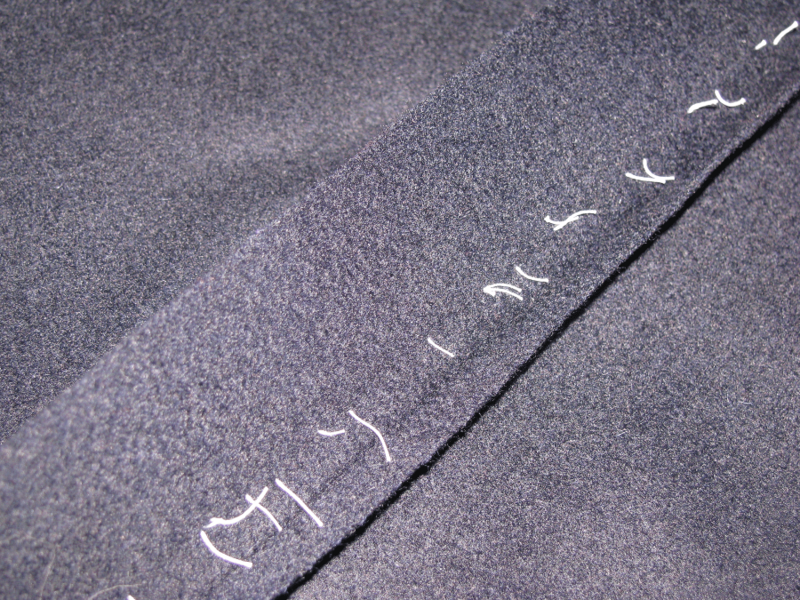 In preparation for the first fitting, the coat was basted together completely by hand. At this point, most of the ironwork was done, except for the chest. This ironwork gives three dimensional shape to the fabric, allowing it to hug the body even closer. Next we have the back piece being pressed. First, the edge is folded over and carefully basted, to form a self facing. It is then pressed. 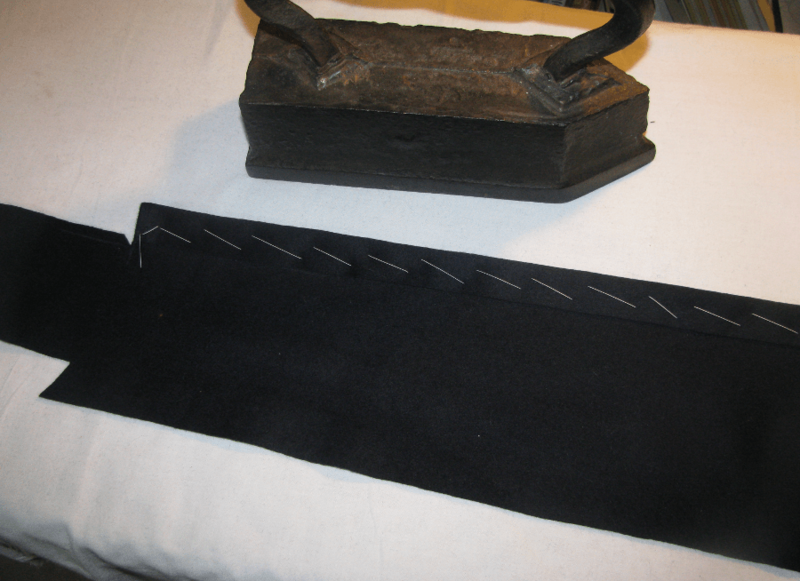 Using a press cloth to prevent shine and iron imprints on the cloth, I carefully wet the cloth, then press with my antique sad iron. The iron weighs 16 pounds and practically does the work for me. No need to press down as with modern home irons. After pressing, the facing is carefully felled by hand. In this next photo you can see just a few of the hundreds of basting stitches needed. 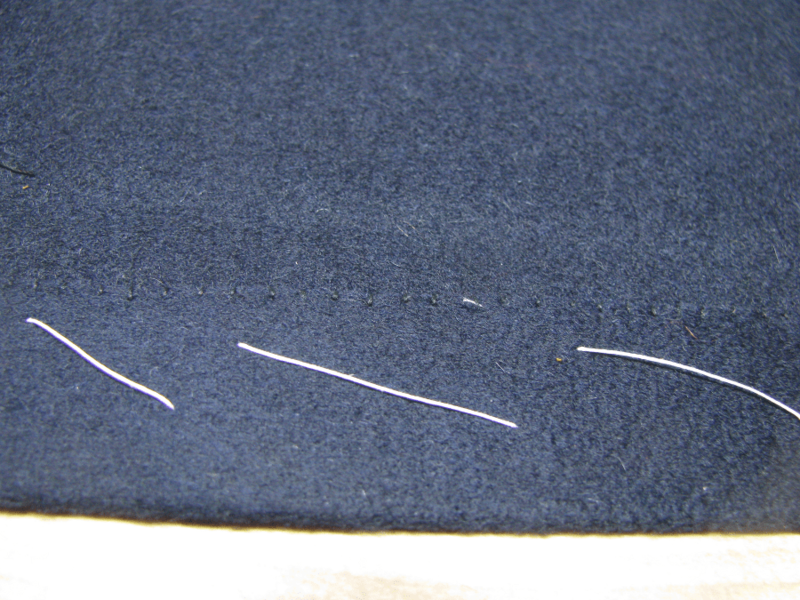 The short cut threads are called tailor’s tacks, and they show the position of the seam line. 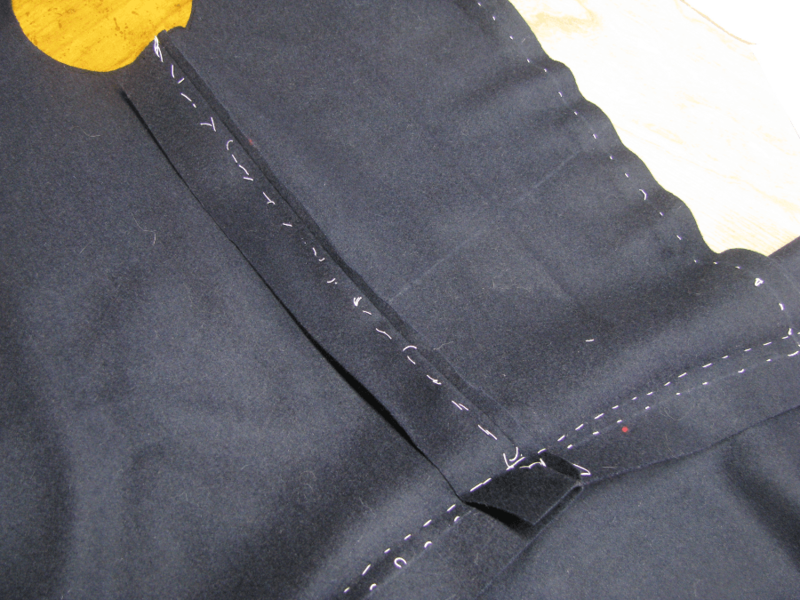 This way, I can add inlays of fabric in case adjustments are needed during the fitting. The other stitches are running stitches which hold the pieces together. Here is the side body piece. It is folded in half lengthwise, and simultaneously stretched on the edges, while being shrunk in the center with the iron. After doing this, it has a nice three-dimensional curve to it; a much nicer shape than a flat, lifeless piece of fabric. 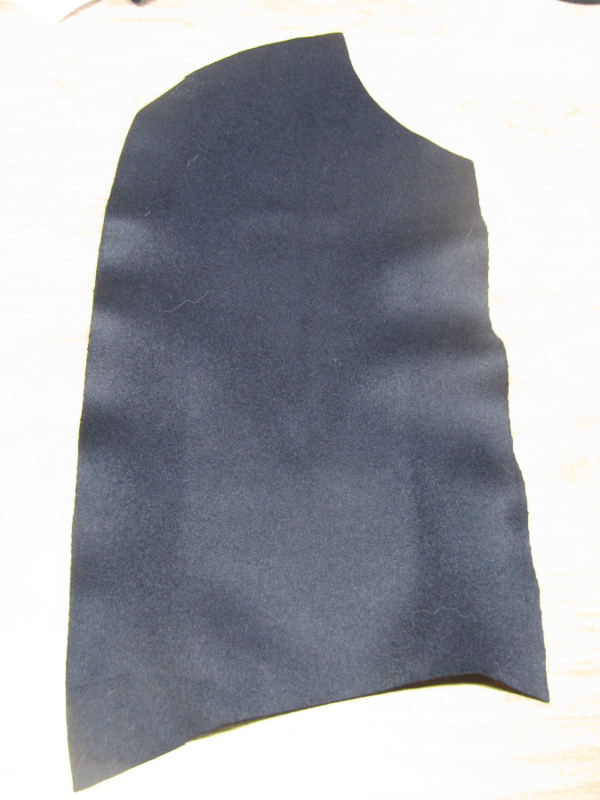 The chest piece is fulled at the centre front, and the excess fabric is worked towards the middle of the chest. This helps to give that pigeon-breasted look so common in the 19th century. This, combined with iron work in the shoulder and neck areas, also helps straighten the fronts to prevent them sagging outwards like so many reproduction coats do. In place of the iron work on the centre front, one can also place two small fishes, or darts to get the same affect. 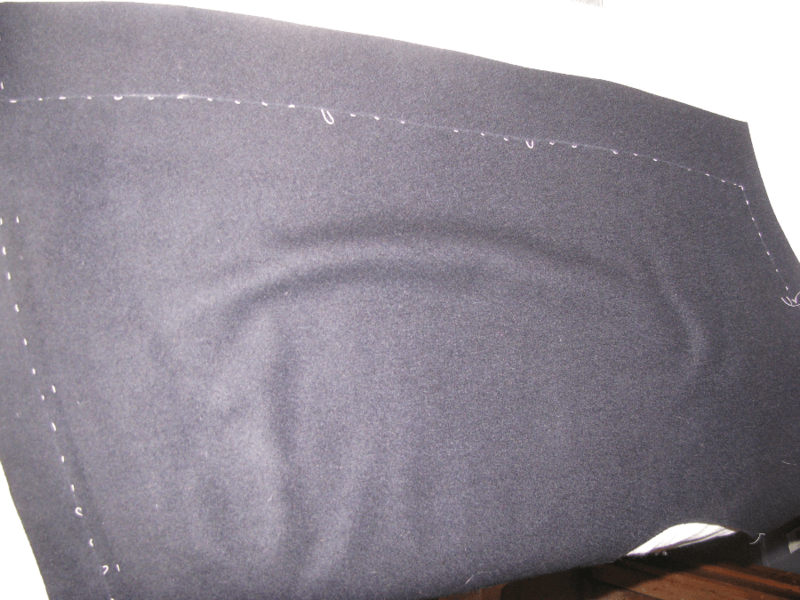 This last photo is of the side seam, showing the tailor tacks and inlay.